You'd think they'd make them more user friendly. This contest is going right down to the wire, Mist!! Yeah ... you'd think they'd at least pad those barbs !! Cute! And, I've often wondered how birds can stand *standing* some of the places that they find. Hmmmmmm!!! That is beautiful yellow bird! Beautiful oriole. The birds seem to figure out where to grip on the wire. I, on the other hand, always seem to get my clothes caught! Pretty little fellow, but definitely not a spot that encourages company! Great timing! Love its vivid yellow color. Very cool to the eyes. I have tried many times in the past to attract Orioles, with no luck. Great to see one on your blog. 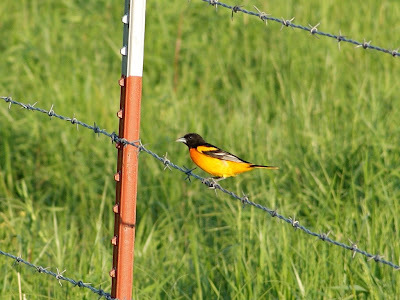 Great photo, I have yet to see a Baltimore Oriole. Our orioles just came back this week, too. This is a great shot! How are you doing? Are things slowly getting back to normal? Oh, wow. I haven't seen one of those for YEARS. How beautiful! He is a very pretty little bird. What a pretty little bird ... perfect for Mellow Yellow Monday too!